To get "more", companies are attempting to become increasingly streamlined and resourceful. The snow and ice management business is no stranger to the efficiency crunch, as it's one industry that's had to be more efficient each and every year in order to keep up with everything from government liability regulations to skyrocketing salt prices. The outside business environment combined with other factors, make it crucial, not just to push snow, but remove it thoroughly and effectively. Whether you're a construction or landscape contractor just entering the business or a seasoned plowing veteran who's been in the game for 10 years, there have never been more reasons to reexamine efficiencies in your operation. One of the most important, if not the most vital, steps to starting up or improving a current snow and ice management operation is having the proper snow pusher. The right pusher will move more snow, increase operator ease and safety and reduce repair expenses, not to mention costly downtime. In addition, the right pusher positively impacts the life of the machine powering it, whether it's a small skid steer or larger loader. Many contractors, whether first time buyers or experienced in snow removal, get hung up on one thing - size. There are really two classes of thought. Some think the biggest, most expensive pusher is the answer. Others approach the decision looking for the smallest, cheapest pusher they can possibly use. But it's more than a matter of size ? snow pushers now offer numerous advancements and features designed to maximize efficiency and help make plowing the white stuff lead to some serious green. With so many options, from different moldboard and hitch designs to cutting blades and side panels, the decision can be overwhelming, especially for a newbie to the industry. But regardless of how long you've been in the plowing game, simply taking the time to look at features and evaluating how each can contribute to an improved bottom line will ensure the best snow pusher choice is made. Snow pusherscome in a variety of styles and sizes. Equipment mounted pushers are commonly referred to as containment plows or box plows. They typically range in size from 6 feet for smaller machines such as skid steers, up to 30 feet for larger equipment like wheel loaders. Pusher or plow size primarily affects how much snow is removed and with what precision. Longer, one - piece containment plows will move larger quantities of snow the first time, but will also leave behind a significant amount as they ride on the highest ground. No pavement, whether a road or parking lot, is completely flat and level. Roads tend to be higher in the center and gradually slope downwards on each side, while parking lots have both raised and depressed areas scattered throughout. A longer snow pusher will always rest at the highest point on a surface and float over lower areas ? leaving behind inches of snow and resulting in the need for follow-up plowing, usually from a pick-up operator with a smaller pusher. Businesses have to make the choice whether to add their own pick-up operator to the staff ? increasing labor, equipment and fuel costs ? or sub-contract that work. Either way, it's going to cost more. There is also a high likelihood that salting will be needed, another time - consuming process and added expense. On the contrary, a shorter snow pusher is more concentrated and precise. Operators are able to better target an area and clear more snow with less follow-up. They are also ideally suited for common, smaller pieces of equipment in a fleet like skid steers and compact loaders. The downside of smaller pushers is more total passes are required to remove the same amount of snow. Outsourcing or adding a pick-up plow to handle follow-ups may be required, as shorter snow pushers will still miss small areas like dips in roads or parking lots. In addition, some degree of salting will be required. It appears to be up to an individual decision on what's more important: sheer volume of snow cleared or precision. But there's an option for those not willing to compromise. To offer the benefit of moving more snow, yet with greater precision and less follow-up, some pusher manufacturers have tweaked moldboard designs and offer sectional configurations. Sectional moldboard designs consist of several pieces that, together, form one large surface area, allowing large amounts of snow to be removed in a single pass. What's unique about these styles is the way the sections operate to also provide precise, efficient removal. Just about every snow pusher on the market offers a trip edge feature. As an obstacle is encountered, the pusher 'trips' or lifts slightly to clear the object without damaging the pusher. The drawback? When the pusher lifts up, it misses a whole pile of snow making re-plowing imminent. Sectional moldboard pushers offer the same concept, but on an individual basis. Rather than the whole pusher width tripping, only the individual section encountering an obstacle trips, leaving virtually no snow behind and eliminating the need for follow-up plowing. Not only does this reduce fuel and labor costs, plowing a clean lot the first time will also eliminate any liability issues and costs resulting from slip and fall claims. The independent movement of each 'mini pusher' provides further efficiency and plowing precision by essentially letting the entire pusher contour to any given surface. On sloped roads, the outer pieces rest at lower points, while those towards the center rise up as the pavement does. The same is true in parking lots. As the snow pusher approaches a depressed or elevated area, the section will respond to the change in elevation and adjust itself accordingly. This ensures virtually no snow is left behind and essentially eliminates the need for a pick-up mounted plow or salting. In addition to providing better clearing performance, the individual tripping action helps prevent damage to the pusher and machine if a small obstacle is encountered. But what about larger, rigid objects like curbs? 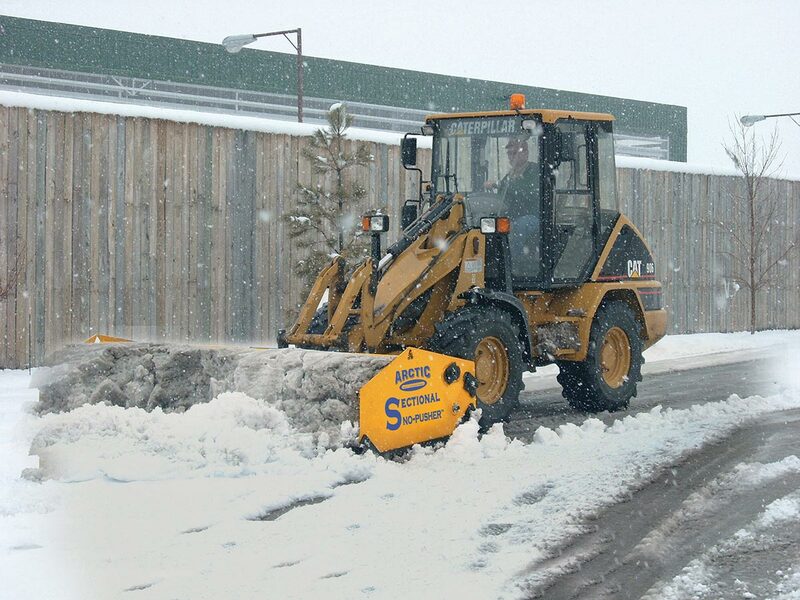 To avoid significant damage, consider a snow pusher with mechanical side panels. Most containment - style plows are built with side panels, or wings, attached to both ends of the moldboard. The panels keep snow contained, eliminating excess amounts of snow rolling off the sides. But fixed side panels pose major challenges. Imagine a loader plowing full speed on a city street using a model with fixed side panels. The snow is deep and blowing across both lanes, so the driver can't see that he's approaching a concrete median on his left side. When he eventually hits it, something has to give ? either the pusher, the machine or the operator is going to absorb the impact. And the last thing any business owner wants is serious injury to an employee ? not to mention the worker's compensation costs that go along with those injuries. In the most extreme cases, an operator has been ejected from the machine's cab upon such harsh impact. To address this serious problem, some manufactures offer pushers with mechanical side panels. Mechanical side panels respond to impact from major obstructions like curbs, medians and manhole covers. Rather than hit these objects head-on, the side panels lift up and go over, clearing even tall obstacles. The benefit is three - fold, as it reduces damage to the equipment, pusher and, most importantly, the operator. Beyond operator safety, there's also the concern of equipment damage. The impact must be absorbed and thus the machine may end up damaged, resulting in significant expense. Skid steers, loaders, backhoes ? any large piece of equipment?cost several thousands of dollars. It could take months of extra work for a contractor to recoup the cost of replacing an entire machine or even undergoing significant repairs. Mechanical side panels minimize the chance of equipment damage, saving on costly replacement and repairs, not to mention downtime. On that same note, a well-maintained snow pusher with mechanical side panels can last several years even with inexperienced operators, positively impacting ROI. Features designed to enhance safety are certainly a top priority. But other advancements have been made specifically with the operator in mind. Think of a typical office workspace. Whether a desk, cubicle or individual office, all are designed for ultimate comfort. Ergonomic chairs, keyboards and monitor stands are no longer a luxury, they're an expectation, designed to make workers more comfortable, productive and efficient. For many plowing professionals, the machine's cab is their 'office'. These individuals spend hours every night in the cab, making it imperative to look for features that enhance comfort along with performance. Newer hitch designs take mental stress off the operator, while also enhancing the life of pusher components ? and reducing the added worry of maintenance and repair tasks. Snow pushers are picked up and dropped down hundreds of times each night. Typical hitch designs force the operator to manually adjust the pusher each time it's dropped, making for a very challenging, time-consuming and often frustrating process, especially for inexperienced operators. Newer "drop-and-go" hitch designs do this automatically; hence the name. The operator can just drop the pusher and go. The hitch design ensures the pusher will lie correctly, each and every time extending product life and ensuring a clean surface even in the case of inexperienced operators. Beyond operator ease, these hitches let the pusher and machine move independently of one another. As mentioned previously, rarely is pavement perfectly level. Take a parking lot ? because the pusher leads the way, it's going to reach a raised point in the pavement before the machine does. Normally in this situation, the pusher will rest itself on the higher ground and lean slightly forward. The action lifts the machine up off its frontwheels, creating inefficient drag, while putting weight on only two tires. Overtime, this will result in uneven tire wear and more frequent replacement issues. This action also puts the majority of weight and stress on the pusher, making premature wear?along with expensive replacement and downtime ? inevitable. With newer hitches, the pusher can lift up and adjust to the pavement, while the machine stays balanced on all four tires ? keeping even wear on the tires and the pusher. Especially when combined with sectional moldboard styles, this movement further lets the pusher continuously adjust to changes in the pavement for optimum pushing efficiency and reduces the need for follow-up plowing. These types of hitch designs prevent premature wear on the pusher's shoes as well. Side panels, whether fixed or mechanical, include smooth, flat pieces called shoes that ride along the surface. Commonly made of steel, the shoes are designed to last through several years of abuse. But their lifespan can be cut drastically short with premature wear, a common occurrence with typical hitch designs that require manual adjustment. "Drop-and-go" styles are designed to lay flat and ensure the shoes do as well, leading to even wear and less replacement, hassle and headaches for the operator. Working together, these features significantly enhance performance and minimize maintenance expense, but one more factor and wear item, plays a significant role. The pusher cutting edge affects, not only performance of the machine, but also the total lifecycle cost of the pusher, and should be carefully considered. Every pusher has a cutting edge. Designed to scrape and clean away compacted snow and ice, cutting edges are like the final icing on the cake ? they add the all-important finishing touch and further reduce the need for re-plowing and salting. Cutting edges are available in a few different options. Ideal for cutting through and scraping snow and ice, steel cutting edges prove to be more effective and more durable than rubber options. On the downside, replacement of steel edges can be significantly more expensive, but that shouldn't necessarily be a deterrent. In combination with sectional moldboards, steel cutting edges are very effective and can be replaced in only one section rather than across the entire length of the pusher. This significantly reduces maintenance costs while providing all the benefits of the steel edge. Clearly, it's not necessarily just one feature that will be the key to productive snow pushing, rather the combined efforts of several. In the grand scheme of things, each feature is just one piece of the total ROI puzzle. Whatever your reason, pushing snow can be a great business opportunity or ideal way to utilize idle equipment and workers during the winter months. The key for anyone performing this task is efficiency, both in terms of the pusher and machine. And a snow pusher with the right features will lead to both. When the flakes begin to fly this winter, be ready to handle every snowfall with the right pusher for your equipment.